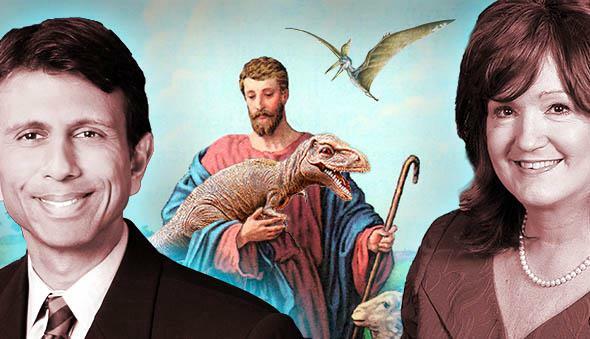 Creationism in Louisiana public school science classes: School boards and teachers teach the controversy. Records show teachers and school board members conspiring to teach creationism in public school science class. Louisiana’s education tribunal: Gov. Bobby Jindal, Jesus Christ, and state Rep. Valarie Hodges. When I was a high school senior in Baton Rouge, Louisiana, in 2010, I began a campaign to repeal my state’s “creationism law,” which allows teachers to sneak religion into public school science classes by using materials that criticize evolution. Seventy-eight Nobel laureates and many other prominent scientists and educators have joined me in calling for the repeal of this law, officially known as the Louisiana Science Education Act, and tens of thousands of people have signed petitions against it over the past four years, but so far we’ve failed. Louisiana teachers can still bring religion into public school science classrooms, legally. There has been plenty of evidence, but it hasn’t been direct. For example, in Tangipahoa Parish, in 2011, school board member Brett Duncan requested that guidelines be developed “for the review of supplemental materials to be used by teachers for discussing evolution, creationism, and intelligent design.” That same year a pupil progression plan (an outline of what a school district intends to do that year) for Terrebonne Parish said that under the creationism law, teachers will “deliver facts for both arguments”—both evolution and creationism. Gov. Bobby Jindal was asked about this law by NBC’s Education Nation and said, “I’ve got no problem if a school board, a local school board, says we want to teach our kids about creationism.” That is in fact why he signed the law. But none of this was enough. I couldn’t name a single teacher who was teaching creationism. “You talk about a back door [to teaching creationism],” Appel said. He told me that I had no evidence “that indicates such a back door is actually being used.” The Senate Education Committee voted against the repeal. When confronted with these episodes, Appel said he didn’t believe that they had happened because Louisiana’s creationism law allows them. Now I have evidence that it’s not just one teacher. I have evidence that religion, not science, is what’s being taught systematically in some Louisiana school systems. 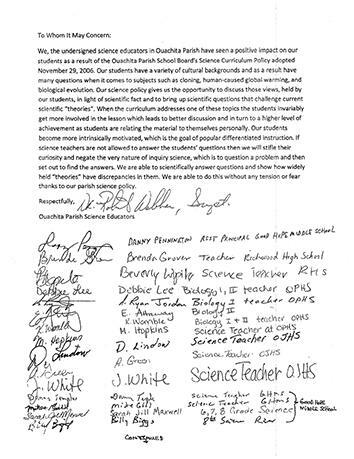 I have obtained emails from creationist teachers and school administrators, as well as a letter signed by more than 20 current and former Louisiana science teachers in Ouachita Parish in which they say they challenge evolution in the classroom without legal “tension or fear” because of pro-creationism policies. I’ve found the back door. I requested a copy of the teacher-signed letter from the Ouachita Parish School Board. The first signature is from Robert Webber, the superintendent of Ouachita Parish Schools, but the school system’s lawyer, Elmer Noah, told me that the letter was not a “school board document” and that the school system didn’t possess it. “I object to your characterization of the document as a public record,” he said. Noah told me that Darrell White, a retired military judge from Baton Rouge, had the last remaining copy of the letter. When I called White and asked him for a copy, he said he wasn’t willing to do an interview and hung up on me. I had met White four years earlier at a hearing of the Louisiana Board of Elementary and Secondary Education to approve new biology textbooks for Louisiana schools—books that included evolution. Standing at the witness table, White held a cane in one hand and with the other was shaking a shirt that read, “natural selection.” According to White, it was the same as the shirt that Columbine murderer Dylan Klebold had worn (Eric Harris, not Klebold, actually wore the shirt), and teaching evolution would lead to a “Columbine-style shooting” in the schools of Baton Rouge. While promoting creationism in Ouachita, White discovered an important ally: Assistant Superintendent Frank Hoffmann. He had presented White’s policy to the school board and told members that teachers would have “academic freedom to teach both sides of controversial subjects such as evolution.” In 2007, Hoffmann was elected to the Louisiana House of Representatives. Rep. Hoffmann took Ouachita’s creationism policy statewide. Along with state Sen. Ben Nevers, he sponsored the Louisiana Science Education Act, aka the creationism law. This law allows teachers to use “supplemental textbooks and other instructional materials to help students understand, analyze, critique, and review scientific theories,” including evolution and global warming. Like the Ouachita policy it’s based on, this law is a back door to teach creationism. In 2012, at the suggestion of Judge White, a small school district outside Baton Rouge, the Central Community School System, adopted a version of Ouachita’s creationism policy. At the Central Community School Board meeting, Mickey Cleveland, a Ouachita Parish teacher, presented a letter to the board in support of the new policy. (Cleveland once told the Monroe News Star that, “Darwin didn’t have the microelectronic microscope. … Science is proving creation.”) This is the letter I would later chase, the one signed by multiple science teachers, which Ouachita claimed was only in White’s possession. The letter was also emailed by White to Central Community School Board President Jim Gardner and board member Jim Lloyd. In November 2014 I sent a public records request to Central Community Schools for the letter, but the administration refused to provide it to me. A secretary told me “no such letter was entered into the minutes nor to my knowledge do any of the board members have a copy of it.” For years Central has provided this response to public records requests about the letter, including one from the American Civil Liberties Union. The reason for this evasiveness from these two school boards is that this is a list of teachers who signed their names to a letter that is for all intents and purposes an admission of teaching creationism. Despite the protections of the Louisiana Science Education Act, it’s still possible that school systems or individual teachers could get into trouble for lessons that are too explicitly religious. In his guidelines for teachers using his curriculum, Pennington advises teachers to “link teaching of evolution to existing school district policies about teaching controversial issues” in order to stay out of legal trouble. In 2010, Livingston Parish came close to endorsing the teaching of creationism. At a Livingston Parish School Board meeting, Jan Benton, then the school system’s director of curriculum (now a member of the school board), told the board that the Louisiana Science Education Act was for “critical thinking and creationism.” Board member David Tate got fired up and announced, “We don’t pray to the ACLU and all them people; we pray to God.” Board member Clint Mitchell said, “Teachers should have the freedom to look at creationism and find a way to get it into the classroom.” But at that time, without money for a possible court case, Livingston Parish decided not to make creationism an official part of the district curriculum the way Central and Ouachita had. From the governor who signed the law to the teachers who implement the policy, everyone recognizes this is about creationism. I told Sen. Appel that I wanted to work with the Senate Education Committee to investigate what was being taught in Louisiana. “I would support that,” he said. I’m working on obtaining copies of Ouachita’s and Central’s curricula and more emails. I’m doing my part. The Senate Education Committee will consider a new bill to repeal the Louisiana Science Education Act on Wednesday. I look forward to the legislators doing their part.